Over on YouTube user knoxieman has uploaded a video that provides a few tips on using DSD+ and an RTL-SDR for listening to DMR digital voice signals. The video is designed as a companion to Tech Minds' video which shows a full set up procedure for DSD+. Knoxieman's video includes some tips on SDR# settings, virtual audio cable setup, and using a program called "DisplayFusion" to keep the DSD+ event windows permanently on top of the SDR# window. Tips on using SDR Plus and DSDPLUS to listen to DMR/DIGITAL conversations. Thanks to Steve K2GOG of The Hudson Valley Digital Network (HVDN) for submitting his post on how to create a wireless display for Pi-Star. Pi-Star is a pre-built Raspberry Pi image for amateur radio users experimenting with digital voice communications like D-STAR and DMR. They write that it can be used for applications such as a "single mode hotspot running simplex providing you with access to the increasing number of Digital Voice networks, [or a] public duplex multimode repeater". Pi-Star is compatible with serial based LED displays with built in GUIs like the Nextion. The displays are usually connected directly to the Raspberry Pi, but Steve wanted to use the display remotely. To do this he used a simple and inexpensive 70cm band HC-12 wireless serial port adapter. 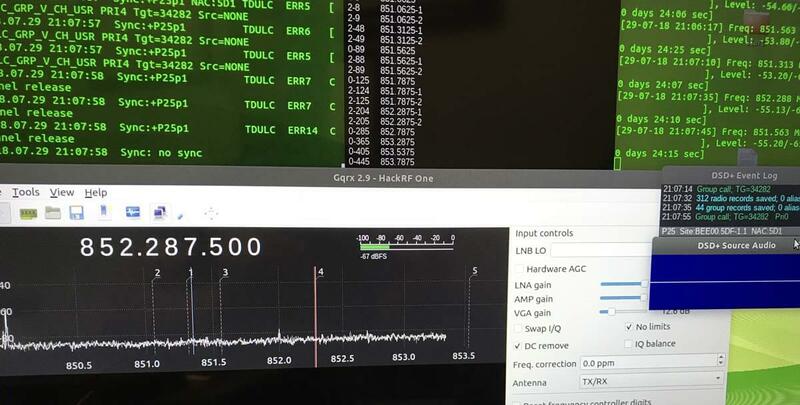 With the wireless adapters connected to the Pi he was able to see the pulses in SDR# via his RTL-SDR to confirm that the wireless serial signal was being sent. He then connected the second wireless adapter to the Nextion display via a few diodes to drop the voltage, and was able to get the display updating as if it was connected directly. In the post Steve mentions that HVDN are also giving away an HC-12 and RTL-SDR to the first person to submit some progress with this idea. Creating a wireless Nextion Display for Pi-Star. I believe that can bridge the gap between using Linux with the ease of use programs of windows. As I am sure we both can attest that setting up trunk tracking / anything SDR is not as easy on Linux as it is on windows. For example, DSDplus FL makes it extremely easy to identify/decode DMR networks. There are similar things that can be done on Linux, but as I stated, it isn’t as easy to setup. So the method that I setup and have been using successfully, using Ubuntu and a HackRF, setting up DSDplus 2.98 on wine, that gets audio piped from GQRX using a virtual sink as outlined in https://www.hagensieker.com/wordpress/2018/04/29/dsd-in-ubuntu-18-04/. It was a great blog, but I felt that it was incomplete when trying to get all the voice traffic passed on a network, as it only works on 1 channel at a time. 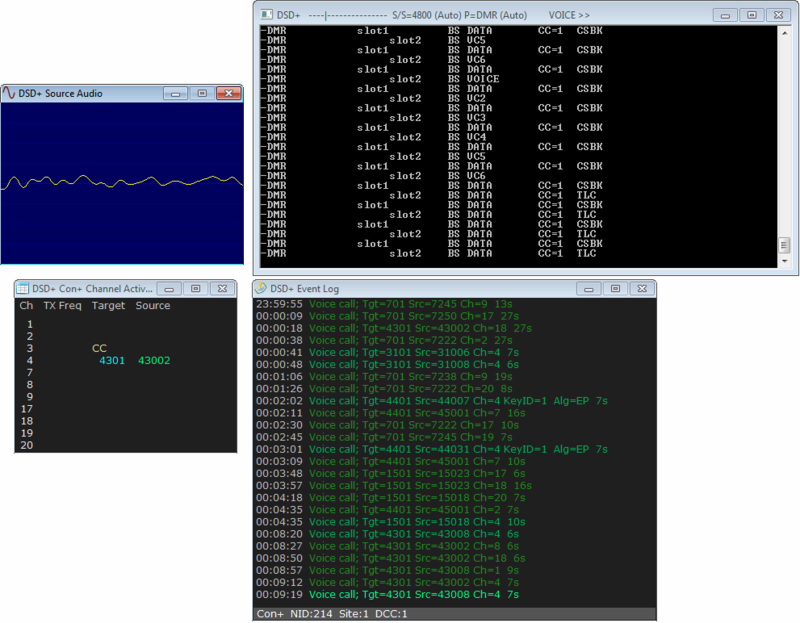 So I found the control channel for the network and created 5 bookmarks in GQRX and gave them the tag “DMR”. From there I downloaded gqrx scanner https://github.com/neural75/gqrx-scanner followed the install and setup instructions. From there I activated the scanner and GQRX will cycle through the frequencies and when voice traffic is passed, it will stop, and DSDPLUS via wine will decode and record the audio. [The screenshot] example was for P25, but it has worked in connect+ as well, the only thing is that you cannot bookmark the control channel. I know other options exist out there such as SDRtrunk / op25 which I have used, but I believe this provides a good alternative to those who have used windows and are comfortable with the ease of use of dsdplus FL but want to be on the Linux OS. Over on YouTube user Tech Minds has uploaded a useful video which shows how to set up DMR decoding with SDR#, VB-Cable, DSD+ and an RTL-SDR dongle. He also uses the DSD plugin for SDR# which makes controlling the command line DSD+ software a little easier. If you are interested we also have a short tutorial on DMR/P25 decoding available here. The video starts from downloading and installing the software, and explains every step very carefully, so it is a very good starting video for beginners. DMR (aka MotoTRBO or TRBO) is a digital voice protocol used by Motorola radios. Software like DSD+ is required to listen to it, but it can only listen in if the signal is unencrypted. Tech Minds has also uploaded several other tutorial videos to his channel over the last few months including guides on how to set up the ham-it-up upconverter, ADS-B tracking, using a Raspberry Pi to create a FM transmitter and more. At the end of last month we uploaded a post highlighting the SDRAngel software, which is a general purpose SDR program with some interesting features such as built in digital speech decoders for DMR, D-Star and Fusion. This avoids the need to pipe audio into a separate digital speech decoder program such as DSD+. SDRAngel also has transmit capabilities which makes it useful for SDRs such as the HackRF, PlutoSDR, LimeSDR etc. Now over on YouTube and his blog K2GOG has uploaded a video tutorial about using SDRAngel. The tutorial starts with installing SDRAngel and explaining that you'll need a 64-bit system and OS to run it. He then goes on to show how to do FM reception and finally how to do digital speech decoding. Update: This post is now very old. The latest version of DSD+ can now to found at www.dsdplus.com. Over on Reddit we've seen mention of an upgraded Digital Speech Decoder (DSD) program, named DSD+. The original DSD is a program that can be used in conjuction with a SDR receiving program such as SDR#, and an audio piping program like VBCable to decode digital speech, such as P25 and DMR/MOTOTRBO. DSD+ claims to have improved decoding and audio quality capabilities. An audio sample from a weak P25 sample can be found here for DSD+, and for comparison here for the old DSD. DSD+ can be downloaded from this megaupload link. To run DSD+. you will need to place an MP3 encoder file lame_enc.dll into the same folder as the dsd.exe executable. This file is not included with DSD+ due to licencing. For Windows, lame_enc.dll can be downloaded from http://lame1.buanzo.com.ar/#lamewindl (Mega Mirror). Download the ZIP option, and then copy the dll file into the same folder as DSD+.